When walking into class, most students dread the feeling of seeing the words “Pop Quiz Today”. We’ve all been there. Yet, a pop quiz can be an excellent opportunity for you to stand out from your fellow students. Read on to find out how you can actually look forward to (no kidding) future pop quizzes! By definition, a pop quiz is a short test given to students without warning. So why is it when we see the two little words “Pop Quiz” at the front of the classroom, they can instantly cause us to have a multitude of reactions ranging from a sinking feeling in the stomach to anxiety to the confidence destroying feeling of hopelessness? The key words in the definition of pop quiz are “without warning”. Facing the unexpected challenge of having to perform well on a moment’s notice, most students find they are usually not prepared to get a good grade on a pop quiz. Worse yet, your poor performance shows the instructor you haven’t been keeping up with your studying. So, at the moment we see the words “Pop Quiz”, we often realize we’re not fully prepared to do our best and as a result, we experience many uneasy feelings. The key to achieving a high score on a pop quiz you find out about only 5 minutes beforehand is for you to know the material and be prepared to perform at your best under test conditions. By using SpeakToYourMind flashcard software, YOU CAN PREPARE YOURSELF BEFORE GOING TO CLASS AS THOUGH YOU KNOW THERE WILL BE A POP QUIZ. This is a very empowering idea. Even Alexander Graham Bell (the inventor of the phone) thought so. Here are a few tips for using the built-in features of SpeakToYourMind to prepare yourself for your next pop quiz and turn any feelings of anxiety into self-confidence. After each class, review your notes and handouts looking for key words or concepts. Then, create a new deck of flashcards for that specific class containing questions and answers that will help you understand and remember these key points. Review. Review. Review. It can’t be said enough. Review your flashcards often to become and stay familiar with your content. Reviewing is the key to learning anything. When you review, you’re moving information from your short-term memory into your long-term memory. Use the different study modes in SpeakToYourMind to engage a variety of your senses while studying your flashcards … look, listen, and touch! Take advantage of these capabilities. The more senses you involve in the learning process, the more likely you are to remember the content. And the variety helps you fight off boredom while studying. SpeakToYourMind’s self-assessment module lets you measure your learning progress. Based on the well-researched learning technique of confidence based learning, this module helps you understand what you think you know versus what you actually know. By continually self-assessing, you can increase your confidence that you really have learned your flashcards. Finally, the random test module is your secret weapon for making sure you’re prepared for a pop quiz. For any flashcard deck, you decide the number of cards to be tested on and SpeakToYourMind creates a random test for you to take. The simulated test environment lets you create an unlimited number of short pop quizzes for yourself and track your test scores so you can be sure you are fully prepared for a real pop quiz on any given day. By using SpeakToYourMind to prepare yourself for each class as if there will be a pop quiz, then the pop quiz will no longer feel like it is being given to you “without warning”. Instead, you’ll be prepared, confident, and ready to do well. As an added bonus, your continuous study efforts will also be preparing you for any upcoming scheduled tests. 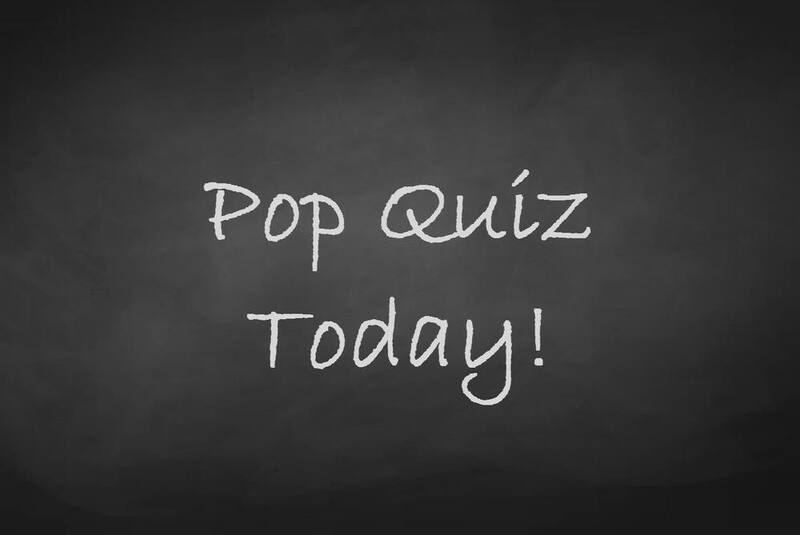 So the next time you see the words “Pop Quiz Today”, you’ll feel more self-confident and see the pop quiz as an opportunity to demonstrate you’ve been working hard keeping current on your studies and are prepared for your instructor’s challenge. The best part is you will be the one leaving class that day feeling good knowing you scored well on the pop quiz! Are you facing a dilemma?